Situated north of the most famous street in Madrid, the Gran Via, that runs from Plaza de la Cibeles to Plaza de Espana, Chueca offers a good glimpse of the real spirit of this city. Life evolves around the square and underground station of the same name. 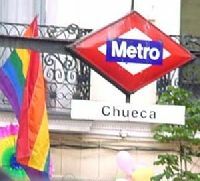 Full of bars and clubs Chueca was one of the run-down districts of the centre city until a decade ago when it became home to Madrid's gay community. It is has now been restored and renovated and the price of housing here has soared. It is very lively and a bit chaotic so if you are looking for a quiet place to live this is not for you. Parking is not easy. There is a small market where you can find whatever you need. The big advantage is its central location and that it is well connected to the rest of the city by the underground. It is a lively at night thanks to the gay community.